It's that kind of piece that breaks your heart into shards, and eventually bends it into something harder and more fragile at the same time. It's that kind of series that leaves you smiling and crying hysterically to the melody of the ending. There is a wide variety of adjectives you can use to describe an anime series; hilarious, dramatic, romantic, horrific, and the like. Natsume's Book of Friends is best described using the words beautiful, heart-warming, and emotional. It is rare to find a series that evokes such powerful emotions in each episode without dropping the ball for four seasons, but Natsume's Book of Friends makes it seem effortless with masterful storytelling along with a strong cast of characters. The premise of the story is supernatural: our protagonist Natsume Takashi can see "youkai" or spirits, a trait inheritedfrom his late grandmother Reiko, along with inheriting her "Book of Friends", which contains the names of youkai that she had defeated and bound to her by taking their name. He then sets out to return those very names while defending himself from those who would use the book for power or personal gain. Throughout the series, he meets, befriends, and also defeats many different youkai along the way. While the premise might be supernatural, the underlying themes present are ordinary, yet powerfully represented and explored. Humans are social by nature, but when the opportunities to socialize are made impossible, feelings of loneliness and sadness become overwhelming and consuming. Natsume's peculiar ability has always alienated him from any potential friends or companions, and as a result feels hated and isolated from the human world. While Natsume's situation is fictional, the problem is all too real. People who have trouble talking to others, or have strange habits or appearances are often shunned and isolated as well, and feelings of loneliness and depression become quite commonplace. Feelings of being left out, of not being wanted, and being misunderstood: everyone in some point in their life have experienced these emotions, and can relate to Natsume in some way, shape, or form, and even if you can't, sympathy is something you will always feel towards him. Such a gentle person put through that kind of mental strain at such a young age can only be sympathized with. Natsume's Book of Friends depicts Natsume's life as he struggles with these issues, and how genuinely kind and helpful people come into his life and give him the encouragement and support he needs to overcome the adversaries within himself. Through his school friends, both those who know about his ability and those who don't, he is greatly encouraged to seek out the positives in his life and to look forward to a bright future instead of his dark past. Instead of only being able to confide and rely in himself, he has trustworthy and genuine friends that he can turn to for aid. His adoptive guardians are loving and extremely caring for people that are very distant relatives to Natsume, and his relationship with them grows into something very powerful and heart-warming where he only wishes happiness and safety for the couple that he could never possibly repay. Each episode is unique story(aside from the two episode stories) that ends in a message for both Natsume and the watcher to take to heart. Each episode evokes feelings of happiness, sadness, or suspense and was entrancing to watch beginning to end. The stories are well written and the pacing, while a bit slow, makes you savor the moments even more. There was never a dull moment; from watching Natsume and Nyanko-Sensei go at it and quarrel like two best friends, to his interactions with the youkai and seeing their stories unfold; simply put, it was beautiful and pleasant to watch. The art is marvelous to look at. The endless creativity of the people who animated this series amazes me. From each individual spirit, to the entrancing landscape and background, to the abilities and interactions of humans and youkai, everything was crisp and well animated. The music often is lighthearted or tugs at the heartstrings. The ED for season 1 is a personal favorite. Natsume's Book of Friends has taken a common genre and turned it into nothing short of a masterpiece. With characters that will stay in your mind long after the conclusion and stories that leave deep impressions and powerful messages, the tearful and joyful moments that this series presents to the watcher is nothing short of beautiful and compelling. Those thoughts never left my head while watching this season. Although I'll have to admit, I was slightly disappointed in the lack of "big events" during this season. However, the anime has always kept a relaxing mood, whilst gently adding action and drama in small amounts. It'd be weird if something completely crazy and big were to happen anyways. I found myself wishing Natsume would say more things, admit more things, yet how realistic is it for him to actually do everything we as the viewers want him to do? In reality, Natsume has always acted in character, even when he grew and his ideals changed, he still was realistic and understandable. Nyanko Sensei was also quite the character. His loyalty was admirable throughout the series, and although slightly boisterous he was undoubtedly intelligent. He managed to subtly enter his way into the family, assisting Natsume's effort to further develop his bonds with not only Youkai, but also humans. When I took a day or two break from the anime, I lost interest in finishing it. However every time I watched just one episode, I was hooked right back into the anime and my eyes were glued to the television screen. I'm definitely going to miss this anime and the characters. I do wish there was another season explaining more of the past of Nyanko Sensei and Reiko. 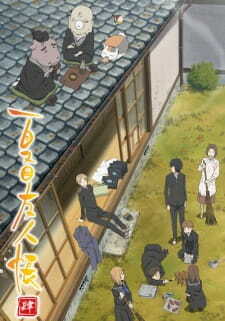 The 52 episodes of Natsume Yuujinchou have gone by so quickly as I would have expected. I bid a farewell to this highly enjoyable anime! Hmm..... how do you review an anime considered to be a sleeper masterpiece? How do you place a rank on the underdog? How, I ask those who are reading this review, How? I am a man of neutralness. I find both good and bad in all animes... all except this. For all 4 seasons, 50+ episodes, I cannot find a single fault with this anime. The story is exceptional... each episode withholds a magic of uniqueness. There's literally no telling where the particular episode will lead to (unless it is an continuation). And although the characters are introduced in a random order, they contribute to the main plot with equal importance. The anime also includes a lot of elements. Romance, thriller, sometimes quite scary, and comedy. And let's be honest, this anime is portraying quite a touchy subject. None of the ghost animes are as carefree and as... laid back as this. Now some may argue this carefreeness causes the anime to be quite boring. But that's just not true. It's laid back because it can afford to. Like I said, it's jumping-around-plot keeps you just interested enough to watch, and keep watching, the next episode. The music, I think, is an element which holds the whole together. Subtle, meaningful, and simply brilliant. It sticks the anime parts together like glue holding an paper aeroplane. Even by itself, the music is great.